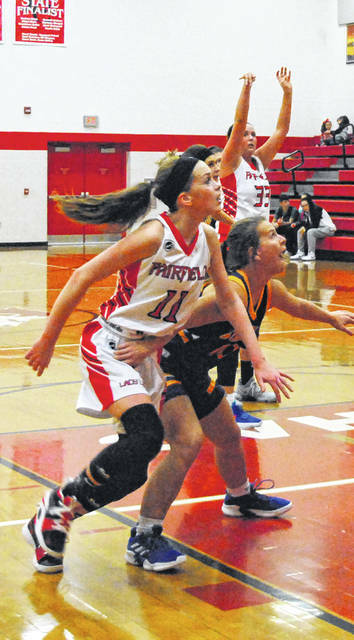 Fairfield’s Emma Fouch battles for rebounding position on Monday at Fairfield High School where the Lady Lions hosted Manchester in SHAC girls varsity basketball action. LEESBURG – The Fairfield Lady Lions hosted the Manchester Lady Greyhounds on Monday at Fairfield High School in a Southern Hills Athletic Conference girls varsity basketball matchup. The Lady Lions fell behind by as much as 25 points in the first half and fought hard in the second half but were unable to overcome the Lady Greyhounds as they lost 57-44. The Lady Greyhounds raced out of the gate with two three pointers before Fairfield’s Braylynn Haines got the Lady Lions on the board with a pair of free throws. Manchester continued to scorch the nets from distance and recorded two more three pointers before their first miss of the night and three in a row to push their lead to 15-2 midway through the first quarter. Samara Cannon answered with a three of her own for the Lady Lions and split a pair of free throws in response to the sixth three of the game for the Lady Greyhounds to make it 18-6. Manchester finished the quarter with six consecutive points and a 24-6 lead as both teams prepared for the second quarter of play. The Lady Greyhounds secured their largest lead of the night at 31-6 following a turnover by the Lady Lions that resulted in a fast break score for Manchester. Lauren Arnold hit a three pointer to spark the Lady Lions and Fairfield began to cut into the deficit with two free throws by Emma Fouch and a layup by Brianna Barnes. The Lady Greyhounds had a three pointer and one of two free throws during the stretch and led 35-13 with 2:14 to play. The Lady Lions continued their surge when Barnes grabbed an offensive board and put it back in before Molly Thackston forced a Manchester turnover and scored on the break to cut the lead to 18 points with the scoreboard reading 35-17. Fouch hit a three pointer for Fairfield that cut the lead to 15 points at 37-22 as the teams headed to the locker room for halftime. The Lady Lions battled hard in the third quarter and cut the Manchester lead to 12 points on two separate occasions but were unable to get closer as they Lady Greyhounds connected on consecutive threes early in the period and went five of six from the charity stripe over the closing minutes to secure a 52-35 lead. The Lady Lions continued to fight in the fourth quarter to no avail. Fairfield had chances to cut the lead but were unable to convert on the offensive end as The Lady Greyhounds won by double digits with a final score of 57-44. Ryan Applegate is the sports editor for The Times-Gazette. Reach Ryan Applegate at 937-402-2572, or on Twitter @RCApplegate89.